Faced with the combination of a $900 million shortfall, a far-right governor, and a newly elected Democratically-controlled Legislature, Maine remarkably avoided both a state shut down and harmful cuts to the elderly, disabled, and poor in the budget. Instead, corporations and some wealthy Mainers will likely pay more in taxes, K-12 education will receive $30 million more funding than last year and state workers will receive their first (very modest) raises in four years. We didn’t achieve all that we wanted to this session, and some of the votes on things like health care expansion were devastating. But the outcome of the budget debate could have been much worse—and wasn’t, in large part because of the incredible organizing that happened all over the state and especially the work of the groups that formed the Fair Share Now coalition. The more than 90 towns where MPA volunteers worked to pass resolutions against the Governor’s budget made a big difference during this budget debate, as did the thousands of calls, emails, and post cards to legislators demanding a fair share solution. MPA members testified at dozens of hearings, held major rallies, and even kept an all-night vigil during the final night of budget negotiations. 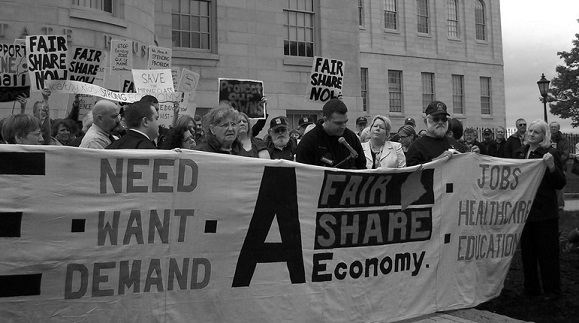 MPA did all of this work hand-in-glove with our allies in the Fair Share Now Coalition. Maine faced such a large budget gap for two reasons: the recession and the implementation of the LePage tax cuts that mainly benefit the wealthy. After nearly three years of the failed economic policies of Governor Paul LePage’s administration, Maine lags behind nearly every other state in job growth—which is a key indicator of the state’s lack of recovery from the recession, and also results in lack of revenue for the state budget. 1. Shift nearly $400 million of costs onto municipalities, necessitating property tax increases. For example, revenue sharing (aka money shared between the state and towns) would have been eliminated. 2. Raise taxes disproportionately on the poor and middle class. LePage wanted to do this directly through the gutting of property tax relief programs, such as the circuit breaker and the homestead exemption. He also proposed taxing magazines and newspapers, as well as making technical changes to raise income taxes slightly. 3. Cut services for the elderly, people with disabilities, and the poor. For example, the Governor proposed the elimination and severe reduction of the Drugs for the Elderly Program and Medicare Savings program. That would have meant over 80,000 seniors, people with disabilities, and many Mainers living in poverty would have lost prescription drug assistance. To be clear, even the Governor himself recognized taxes must be raised to fix the mess he created. The only question was who was going to pay these new taxes: low and middle-income Mainers who had already made tremendous sacrifices during the recession; or wealthy people who had not yet been asked to contribute during these tough times. Democrats proposed repealing the LePage tax cuts in order to safeguard these important programs and prevent the deep cuts to towns. Unfortunately, their Republican colleagues refused to even consider this option. In order to prevent a shutdown, Democrats and Republican legislators eventually agreed to a more regressive deal, one that could survive the expected veto from the Governor. • Restoration of about two-thirds of the cuts to municipalities. Although not perfect, most Mainers will not see a property tax increase above $100 this year. • Investment of $30 million more in K-12 education. Democrats took control of the legislature with a mandate to put Maine on a path to fully-funding schools at the 55% level mandated by referendum. This $30 million increase is above and beyond what it takes to neutralize the effects of the teacher retirement shift and last year’s curtailment. • No serious cuts to health and human services. While some co-pays increased for those with prescription drug assistance, no one will be eliminated from the program. SSI for legal immigrants was fully restored. General Assistance was held mostly intact. • State workers received funding for their first raises since the recession. Departments reported incredible difficulty recruiting and retaining employees for such vital public functions as the state’s emergency dispatch center. Some modest increases for merit and longevity will hopefully begin to address these issues. • Clean elections funding for legislative candidates was restored with a modest increase to counter post-Citizens United spending. Gubernatorial Clean Elections funding was eliminated, unfortunately. • The “circuit breaker” property tax relief program had its funding cut in half, but will soon have much broader impact. It will now exist as a line on the income tax form, as well as accessible through the centralized “ACES” database for low-income service programs. To pay for all this, the revenue package included a half-percent increase on the sales tax, a tax increase on the wealthy through the limiting of tax deductions to $27,000, closure of $40 million in tax loop holes and an increase in the meals and lodging taxes. MPA did not support many pieces of the budget—such as the regressive sales tax increase and the cuts to circuit breaker program—and therefore did not endorse the budget deal. Nor, however, did MPA actively oppose it. It became clear that Democrats had pushed their Republican colleagues as much as they could under the circumstances and this was the best deal possible. Besides the budget, very little else of significance could be passed due to an intransigent Governor who set a record of 82 vetoes in one session. Common-sense measures such as increasing the minimum wage and labeling products that contain the toxic chemical Bisphenol-A all were blocked by those vetoes. Most heartbreaking was the failure to accept federal funding for expanding health care, which would have allowed 70,000 Mainers access to health coverage. The House fell just two votes short of overturning LePage’s veto. Republican Representatives Sharri MacDonald (Old Orchard Beach) and Windol Weaver (York) voted for the bill before the veto, but lost their courage on the over-ride vote. Please see the scorecard section of this Alliance for information on how your legislators voted on these and other important issues. If there is one thing that is clear, it’s that elections matter. All the work MPA members did to elect true progressives paid off in a better budget deal and a block to the extreme LePage agenda. The failure of the Medicaid expansion vote, however, indicates how far we still have to go and the importance of the elections in 2014 for both the Legislature and the governorship.